Found this gem from 2004 while going through old files. Could not not share. Thinking you might pick up an idea or two to round out your plans for World Creativity and Innovation Day, April 21 and/or World Creativity and Innovation Week April 15-21 celebrations. Twelve years ago not as much was known about creativity and innovation; the terms didn’t easily roll off the tongues of our leaders then, there were far fewer news headlines containing the words. When people ask why during this one week you encourage them to explore and expand their creative potential, tell them this: the goal is for everyone on the planet (for now) to experience at least one moment of inspired joy during that time frame. Imagine how that would be, eh? In 2004 WCIW didn’t exist – not yet. 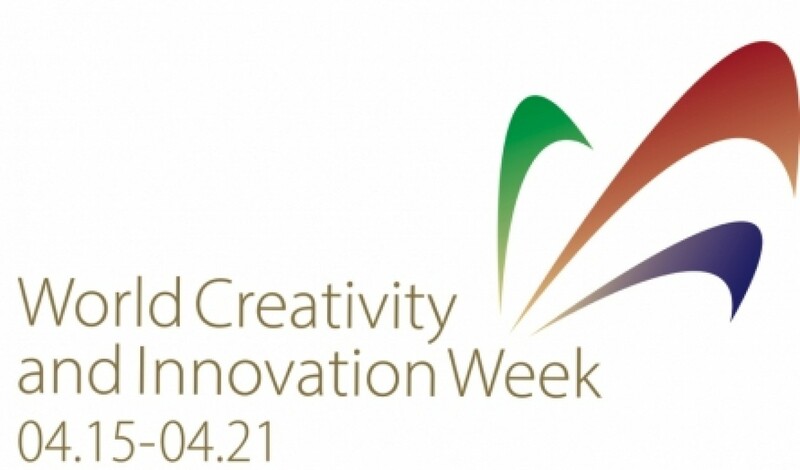 We called April 21 Creativity and Innovation Day (CID) and referenced the week leading up to it as idea week, beginning on Leonardo da Vinci’s birthday, April 15th. Celebrations that year included activities in over 45 countries, One was a workshop day in Toronto called, Admit it. You are Creative! Participants were given small and potent doses (like espresso) of different approaches and experiences in creativity and innovation. Other celebrations included creativity themed street markets in Bangkok, Thailand, and Zona Norte, Argentina; creativity gatherings in Rio de Janeiro and Slovenia. radio shows in Peru. Leo(nardo da Vinci) Awards were given out in Chicago to local businesses for advanced creative approaches. The list goes on. This first section shows early positioning thinking for CID. The capacity to create is inborn. CID provides a service to people to realize their creative contributions – to make new decisions; to replace fear with confidence, and to celebrate making new decisions. CID can be leveraged to honour risk taking to make the world more sustainable. What industry does it belong to? Training, education, entertainment, recreation, technology, information, financial, social clubs, PTA’s; wherever people are. What products or services does it provide? Why does Creativity Day have a week’s lead up? Why is it more than just one day? Creativity is more than an event. It’s a process. The reason the celebrations last for a week is to model this very important concept. What happens each day of the week leading to Creativity and Innovation Day? Each day, individuals, teams, organizations, families, schools and communities host an activity to welcome, engage, and contribute pride in creating and innovating. Started by Marci Segal, creativity specialist and author, CID is observed and supported by concerned and influential individuals and groups of people all over the world who recognize the need for creative energies and innovation to be celebrated, affirmed and used for creating new desirable futures. (In 2017 WCID, World Creativity and Innovation Day, April 21 was adopted as a United Nations global day of observance). What is the intent of CID? • Sponsor an event in your local community, group, school, or association. • Identify people who are passionate about releasing creative potential, hold a conference, a show, a fun fair. • Show off your achievements and accomplishments. • Have a dinner with friends and toast each others’ creative and innovative achievements and discuss what else is new and on the horizon. What support is available for CID activities? Funding is being sought from local community groups, associations, governments, industry and corporations. More sponsors are needed. Can you help? Hope you found these helpful. Maybe a new thought or two was triggered for you about ways to celebrate WCIW this year. And yes, we continue to look for sponsors. Activities and funds are welcome. Add your activity here and use the donate button on the left to make a contribution that will help make a difference moving forward. Join the energy! Connect, explore, enjoy and urge your colleagues, friends and family to do something different during World Creativity and Innovation Week this and every year.